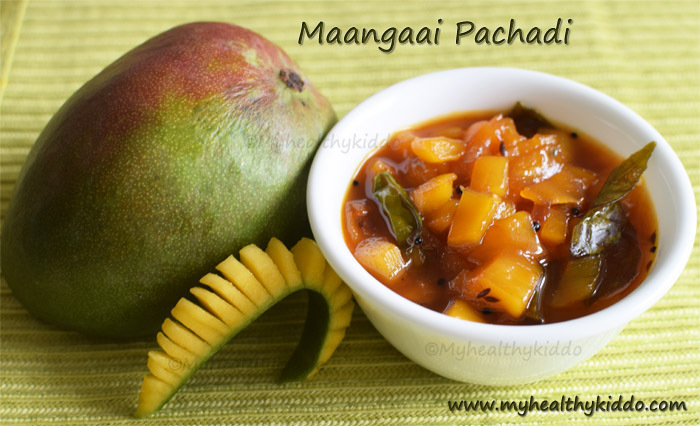 Manga pachadi is a spicy sweet dish using raw mango. 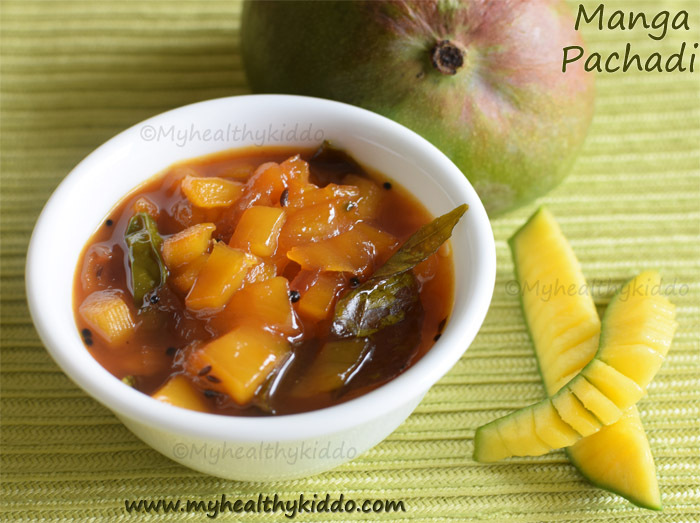 Mango pachadi is a blend of four tastes – sour, salty, sweet and savory. Do try and love it. Caution: “Beware of finger-licking!!”. I loved manga pachadi so much, when I was pregnant.. 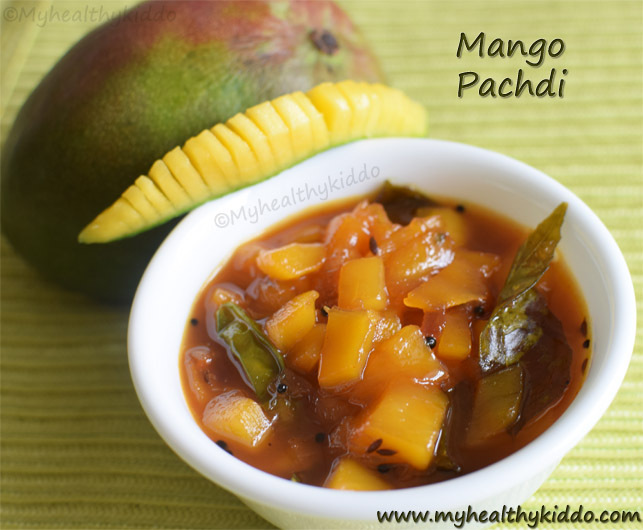 The truth is, I love it anytime and pregnancy just elevated my craving 😉 I always close my eyes whenever I eat manga pachadi, just for the heartfelt relish.. My kid Nilaa have got that habit from me and she fondly calls it as “Mango jam“.. If you are an ardent fan of raw mango, do try my raw mango rice recipe(click) too. Wash and peel the skin of raw mango. Cut into small and thin slices, discarding the seed. Chop onion. Wash few curry leaves, 1 green chilli and keep ready. Add a tbsp of sesame oil to a pan and once hot, add ¼ tsp mustard seeds. Once spluttered, add ¼ tsp urad dal and ¼ tsp jeera. Once urad dal slightly changes color and cumin seeds start to crackle, add chopped onion, curry leaves and green chilli, with a pinch of salt. Once onions turn translucent, add chopped raw mango slices and fry for a min. Add ⅛ tsp turmeric powder and ½ tsp chilli powder. Fry for a minute and then add water till immersing level(I added ¾ cup water). Cook covered for 10-15 mins in medium-high flame until mango is cooked tender. In a separate pan add ½ cup jaggery in ¼ cup water. Boil until jaggrey dissolves fully and bubbles up. Strain jaggery syrup to cooked mix. Cook opened for 10 mins or until desired consistency. I like to have some juice in it. 1.If you like sour taste, get extremely raw mango. If you wish for less sourness, select mildly ripe mango. 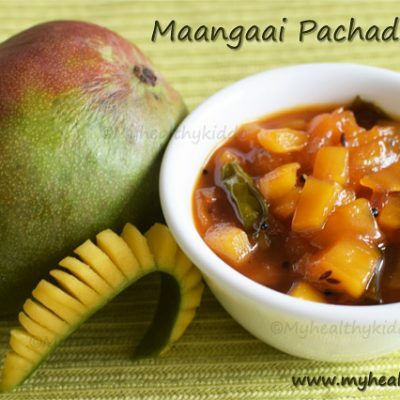 3.Do not skip the pinch of salt as it elevates the flavor and sweetness in manga pachadi. Preparation – How to make manga pachadi? 1.Wash and peel the skin of raw mango. Cut into small and thin slices, discarding the seed. 2.Chop onion. Wash few curry leaves, 1 green chilli and keep ready. Add a tbsp of sesame oil to a pan and once hot, add 1/4 tsp mustard seeds. Once spluttered, add 1/4 tsp urad dal and 1/4 tsp jeera. 3.Once urad dal slightly changes color and cumin seeds start to crackle, add chopped onion, curry leaves and green chilli, with a pinch of salt. 4.Once onions turn translucent, add chopped raw mango slices and fry for a min. Add 1/8 tsp turmeric powder and 1/2 tsp chilli powder. 5.Fry for a minute and then add water till immersing level(I added 3/4 cup water). 6.Cook covered for 10-15 mins in medium-high flame until mango is cooked tender. In a separate pan add 1/2 cup jaggery in 1/4 cup water. 7.Boil until jaggery dissolves fully and bubbles up. Strain jaggery syrup to cooked mix. 8.Cook opened for 10 mins or until desired consistency. I like to have some juice in it. If you like sour taste, get extremely raw mango. If you wish for less sourness, select mildly ripe mango. Do not skip the pinch of salt as it elevates the flavor and sweetness in manga pachadi.